Zero Tolerance for Intolerance. No More Excuses. No Exceptions. We are deeply saddened as we are outraged at the murderous attack at Congregation Etz Chayim, Tree of Life, in Pittsburgh, Pennsylvania. This hate driven murderous assault on innocent people attending a religious service must be condemned by all people who care about our society and country. But words are not enough. There must be concrete action at every level to address the promoters of hate and the sources of incitement to violence if we are to root out racism, bigotry and anti-Semitism, which has increased significantly in recent years. There must be zero tolerance for intolerance. No excuses no exceptions. The expressions of solidarity and compassion coming from all sectors must be the basis for ongoing common efforts. We must continue to be united to confront the challenges and prevent the recurrence of such a barbaric attack. It is noteworthy that this vile act tales place when the 80th anniversary of Kristallnacht is being commemorated. While there is no comparison between the apparent act of an individual and state-organized actions, it is a reminder that we must act decisively and immediately to prevent the cancer of anti-Semitism from growing and infecting our society. We salute the first responders and all the law enforcement officers who confronted the killer at great personal risk. We pray for a speedy recovery of the police and worshippers who were wounded and mourn with the families of the victims to whom we extend our sincerest condolences. 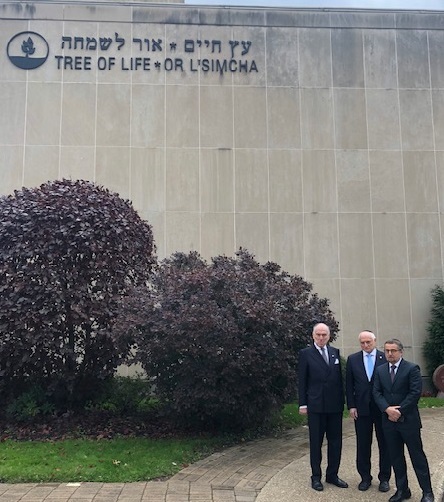 We stand in solidary with the members of Etz Chayim and the entire Pittsburgh Jewish community.